Prepare the simple meal — be sure there is enough for everyone! Alternatively, ask volunteers to prepare simple meals of their choosing. Be sure to have spoons, bowls, etc. Be sure the TV is placed somewhere all can see and that there are enough tables and chairs for everyone. If you are using informational handouts on the featured country, place them on the tables for participants to review as they gather. Place pieces of paper and markers at each table. 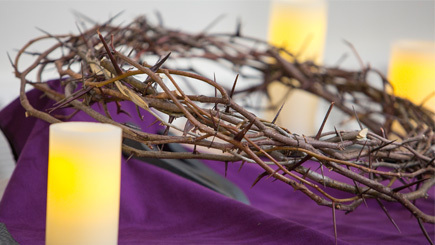 God of all people, we offer you our Lenten journey. May we learn to walk as one human family, remembering in a special way those who are poorest and most in need. Bless our prayers, our fasting, and our Lenten gifts. Through these actions, we show our love for your Son, Jesus, and answer your call to love one another. Amen. Invite participants to fill their plates, explaining that these are simple meals inspired by real recipes from other countries. Remind participants that there are handouts at their tables describing the reality faced by communities in these countries — this might be good dinner conversation, or you might want to share a few facts while everyone is getting their food. Alternatively, participants may want to talk about times they visited communities facing issues of poverty, hunger, discrimination, or rejection. As the meal is ending, return to the theme of simplicity, noting how people often associate Lent with “giving something up” or “taking something on.” Too often, though, Lenten observance stops here and there is no real reflection done on why we fast. Ask participants to consider this: God emptied Godself out of love in order to become human in the person of Jesus. We are called to do the same in our Lenten fasts — this is what simplicity can and should point to. Invite those gathered to read the quotes on the walls and consider the following: How do these quotes point to the meaning of Lent? How do these encourage us in our own Lenten journeys? What do they say about God? Allow time for discussion in small groups and an opportunity for small groups to report out to the larger community. Ask the group to consider how the themes addressed in the video connect with the idea of simplicity. Invite those gathered to reflect on what Lent is to them. They might write an answer on the paper provided (e.g., “What is Lent? Lent is …”), or they might want to make their own brief video in the spirit of the What is Lent?video series. Divide those gathered into groups of three to four and allow each group to spend 15 minutes making their videos. When you return to the larger group, ask individual groups to share, if appropriate. Invite those gathered to share their reflections via social media. Be sure to hashtag #4Lent4Life to be included in the larger CRS Rice Bowl conversation, but also encourage participants to Tweet at or tag parish social media or other relevant accounts to be shared with your local faith community. Read the following reflection aloud: We don’t hear a lot of Greek these days, so the word “kenosis” might catch us off guard. It’s an important word, though, that points to an even more important concept. “Kenosis” is the self-emptying of Christ, the gift of God’s love to us. It reminds us that God the Son emptied himself of what it meant to be God to take on what it meant to be human in the person of Christ — and that it was done solely out of love. It’s what we’re called to do each and every day: push aside what it means to be me so I can take in Christ to better serve others. It’s the very nature of relationship, the very nature of love, the very nature of God. It’s what the Eucharist is all about. When we think about fasting and feasting, this is where we should begin. The fast is an invitation to remove those things that get in the way of loving others; the feast is an invitation to take part in God’s glory. We can’t do one without the other. The missing piece of the puzzle? Don’t forget John’s account of the Last Supper. Luke describes a familiar scene: the breaking of the bread, the sharing of the cup, friends gathered for a meal. Jesus uses tangible, earthly things to make present a very intangible, heavenly reality. But in John’s Gospel, Jesus washes the feet of his disciples — he serves them. This, then, is what the Eucharist is all about: service and love of others. This is how we connect the fast with the feast — by following Jesus’ example. Taking part in the Eucharist goes beyond receiving Holy Communion. Taking part in the Eucharist happens every day in how we treat our neighbors. Allow participants to offer their own petitions and then close with the Our Father. CRS Rice Bowl’s Global Kitchen videos feature Fr. Leo Patinghug. He gives a step-by-step walkthrough on preparing the simple meals. These might be helpful additions, especially if food prep is done as a group. Videos can be found at crsricebowl.org/recipe-archive. Additionally, CRS Rice Bowl and CRS put out numerous videos and resources that connect issues of global justice and solidarity with personal faith formation and prayer. The best place to start is the Catholic Relief Services YouTube channel. Eric Clayton serves as a program officer at Catholic Relief Services in Baltimore. He's Jesuit educated -- a graduate of Fairfield University -- and has spent time with the Salesians teaching English in Bolivia. Follow him on Twitter @eclay1988.